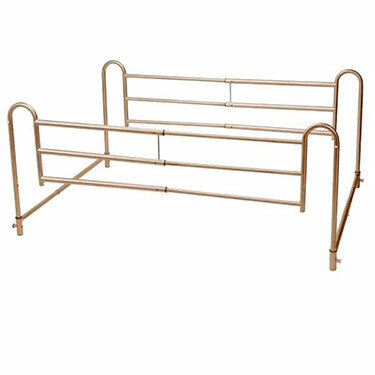 These adjustable length bed rails by Drive Medical are highly accommodating and will fit a Twin, Full, Queen and California King size beds, with the included extender. The easy-to-install (and remove) crossbars adjust between 36" and 72". The side rails adjust to 37", 43" or 57" in length without tools. Both upward and downward adjustments are simplified by a spring-loaded release. The 1 inch steel construction with brown vein finish is durable and strong yet attractive. The product is protected by a manufacturers limited lifetime warranty. Easy to assemble and I received them quickly. These bed rails are great! Easy to set up and use. WE got these for our elderly brother who tries to get out of bed by himself and ends up on the floor instead. Since we got the bed rails, he can't do it by himself and therefore, stays safely in bed. Cons:the bars that go under the mattress, it would be nice if they were somehow a flat bar so that the mattress can still rest on top of the box spring. There is a gap between the two. Other then that very nice.